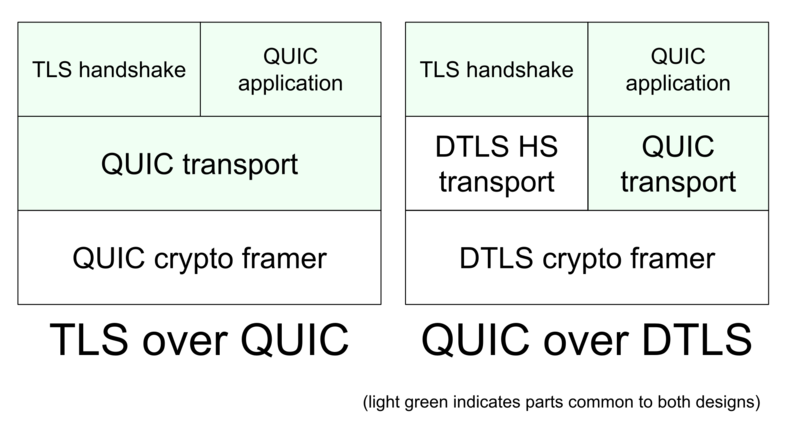 > I'd like to discuss refactoring things to run QUIC over DTLS. Thanks for sending out the proposal! the stream seems easier than closing it. >     handling to avoid accidentally encrypting them. >     goes into negative credit after the handshake completes. you're concerned about here, though. >     packets, as both cleartext and ciphertext ACKs are possible. with it -- if anything, this sounds like a reason to simplify the ACK rules. > is perfect, but on balance, I think this is a cleaner structure. > case, the result was considerable simplification. less polished than commonly used transport stacks. avoiding painful cross-interactions between them. whole host of new yet-untackled problems, I am much more skeptical. > priorities in the context of the pros and cons of the proposal. > about this in addition to on-list discussion.